Brigadier General Alan C. Edmunds is commander, 47th Air Division, Strategic Air Command, Fairchild Air Force Base, Wash.
General Edmunds was born in Oradell, N.J., in 1919. He graduated from the South Kent School in Connecticut in 1937 and enlisted in the 1st Infantry Division in 1939. He entered the U.S. Military Academy at West Point, N.Y., and attended flying training at Stewart Field, N.Y., prior to graduation from the academy in June 1944 with a commission as second lieutenant. He then was assigned to the Asiatic-Pacific Theater of Operations where he served in wing and squadron officer positions. In March 1948 General Edmunds was assigned to the Armed Forces Special Weapons Project at Sandia Base, N.M. He served with the Research and Development Division at Sandia Base until January 1950 when he attended the Air Tactical School at Tyndall Air Force Base, Fla. He returned to the Research and Development Division in June 1950. In December 1951 he was appointed assistant director of special weapons in the Operations Division of Headquarters Tactical Air Command, Langley Air Force Base, Va. While at Headquarters TAC, he also served in positions as staff operations officer and chief, Atomic Division. In July 1954 he was assigned to the 21st Fighter Wing and served as air operations officer and commander of the 531st Fighter Bomber Squadron. From February 1958 to August 1961, General Edmunds served at Headquarters U.S. Air Force in Washington, D.C., first as operations staff officer, Operations and Weapons Systems Division, the Inspector General, and later, as special assistant to the chief of staff of the Air Force. After attending the U.S. Naval War College at Newport, R.I., from August 1961 to July 1962, he was assigned as deputy director of requirements and later as chief, Fighter Reconnaissance Division, Headquarters TAC. In September 1964 General Edmunds was assigned to Vietnam as deputy for air operations to the assistant chief of staff for operations (J-3) Military Assistance Command, Vietnam. At the completion of his tour in Vietnam he was assigned to the Organization of the Joint Chiefs of Staff as a member of the Pacific Division and later as chief of the Current Operations Branch, Pacific Division. In November 1966 he was assigned as the Air Force member of the chairman's Staff Group. 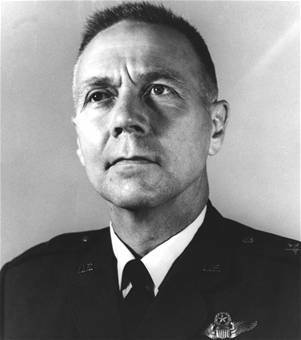 General Edmunds was assigned as 57th Air Division commander with headquarters at Westover Air Force Base, Mass., in August 1968. He assumed command of the 4252nd Strategic Wing with headquarters at Kadena Air Base, Okinawa, in August 1969. His military decorations include the Legion of Merit with oak leaf cluster, Air Medal, Air Force Commendation Medal and Army Commendation Medal.